General applications traditionally requiring various materials such as all iron, bronze-fitted or all bronze construction. Construction: Available in bronze-fitted (BF), all iron (AI), or all bronze (AB). Bronze-fitted means bronze impeller. Frame-Mounted Design: Flexibility of installation and driver arrangements. 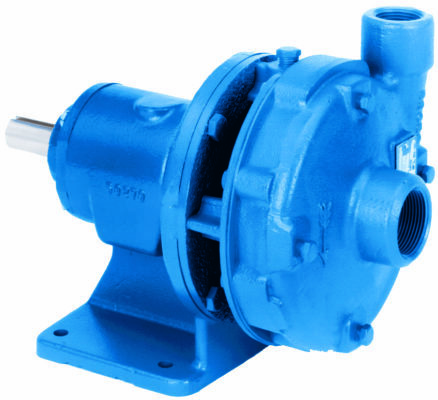 Cast Iron Power Frame: Rigidly supported, grease-for-life ball bearing assembly. Impeller: Enclosed design for high efficiencies. Threaded directly on pump shaft. Stainless steel locknut on three phase models. Requires no clearance adjustments. Balanced for smooth operation. Mechanical Seal: Standard John Crane Type 6 with carbon versus ceramic faces, BUNA elastomers, and 18-8 stainless metal parts. Optional high temperature and chemical duty seals available. Motors: NEMA standard open drip-proof, totally enclosed fan cooled or explosion proof enclosures. Rugged ball bearing design for continuous duty under all operating conditions.